Fill in your details below and we will let you know within 24 hours if we can get Pictomania to you with haste! Do you know what a zebra looks like? Can you draw it? No, well, then this game is perfect for you! Any zebra drawing you do will be fine as long as the other players don’t think your zebra is… a car! In Pictomania, it really doesn’t matter if you can draw well. Each player will draw a picture of a word given to them and at the same time try to guess the drawings of the other players. You don’t have time for a masterpiece – just a small doodle will suffice – and then you will have more time to guess! The player who can doodle just a little bit while making good guesses at the other drawings will be the winner! 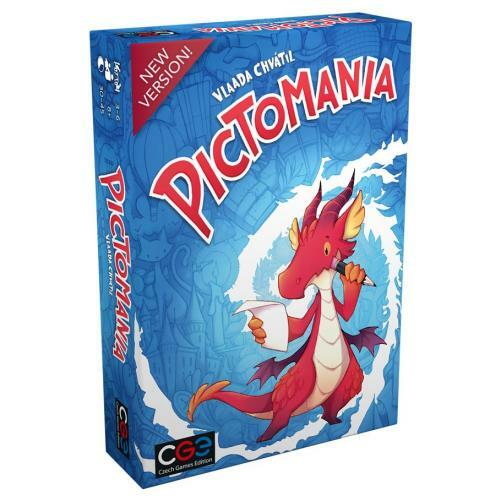 Pictomania lasts five rounds, and at the start of each round, you set up six randomly drawn cards on card racks visible to all players. Cards are double-sided, come in four levels of difficulty (for much replayability), and include seven related words on a single side. In addition to a set of guessing cards, scoring tokens, marker and drawing board, each player receives one symbol card and one number card, which together indicate which word or phrase on the revealed cards that player must draw. Bonus tokens equal to one less than the number of players are placed in the center of the table. Players simultaneously look at their cards and start to draw. While drawing, they can also watch what others are doing and place a guess card on that player''s stack. Only one guess per player is allowed, and once you make a guess, you can''t change your mind. Other players will ideally be playing guess cards on your stack, too. Once you have finished drawing and guessing – and you''re not required to do either – take the highest-valued bonus token from the center of the table and take no other actions. Once the final bonus token is claimed, the round ends. One by one, players reveal what they were drawing and the guesses that others made. Those who guess your word earn one of your scoring tokens, with early guessers earning more points, while those who guess incorrectly have their card placed in the center of the table. Once all the guesses are resolved, you determine the black sheep – the player who made the worst guesses. If a single player has more cards in the center of the table then anyone else, then his bonus token (if any) counts as negative points. What''s more, if no one guessed your word, then you throw away your bonus token, scoring nothing for it. You sum positive points for the round (a bonus token scored, and scoring tokens from the words you guessed correctly), then subtract points for the black sheep "bonus" and all the scoring tokens you didn''t give away to determine your final score for the round, which could be negative.